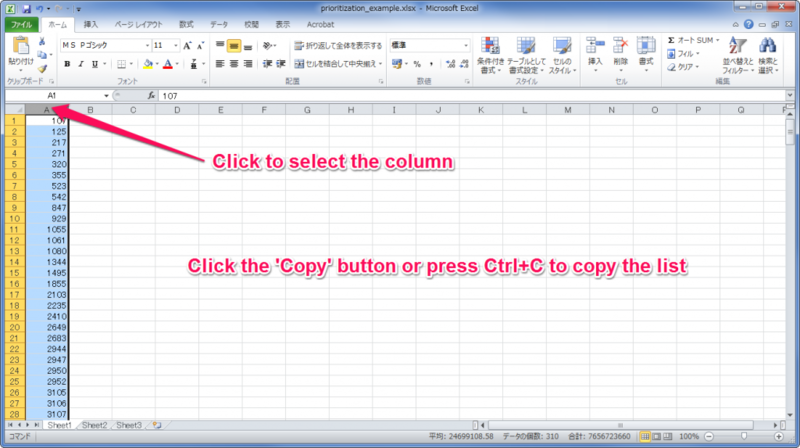 We will start this tutorial with an Excel file which contains a list of interest genes. And come out with few prioritized candidates. You can use your own data or download an example from here. 1. Open the gene list with Excel. Click the column header to select the column. Click the ‘Copy’ button or press Ctrl+C to copy the list. 2. Go to the TargetMine main page and click the ‘Lists’ tab. 3. Click the ‘Upload’ tab if you are not in this tab. Make sure the Type is ‘Gene’ . 4. Click the text area and paste the list. You can press CTRL+V or right click the text area to bring out the menu, and click ‘Paste’. 5. Click ‘Create List’ to continue. 6. In the ‘Verify identifier matches’ process, you may find some identifiers that are not found in TargetMine in the bottom prat. This may be caused by miss-typing or the identifier has been deprecated. Normally, you may want to examine those identifiers but in this tutorial, let’s ignore these identifiers and click ‘Save a list of Genes’ to continue. Name your list and click ‘Save’ to continue. 7. You have uploaded a list to TargetMine now. Now, you have a list called ‘my_gene_list’.